Dede Haas is the Channel Strategist for DLH Services in the Washington DC area in the USA. 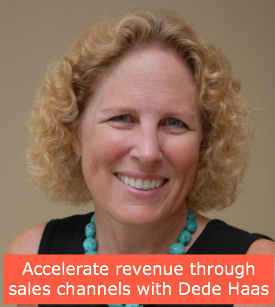 Being in channels since 1985, Dede is an experienced channel expert who helps small and medium sized businesses build channel sales teams and channel programs. In this episode you will hear Dede explain what a channel is and how OEM and licensing can fit into the description of channel sales. Dede brings experience to the conversation from large companies like Intel and smaller companies. Many of the channel development situations that Dede is involved in start from the ground up. Many companies are looking to jump onto the channel bandwagon, but channel is not for everybody and is certainly not a magical solution. Selling through a channel is not something that will happen overnight. Dede explains how it’s a learning experience that companies need to go through to decide if it fits their organization and desired solution. Essentially a channel is there to help your partner build their business by selling your stuff. With a channel solution you are not expecting your partner to do all the work, but you as a provider need to enable your partners to be successful. In her work Dede is helping her clients to create the program, build relationships, recruit the partners and recruit the right people in their organizations to manage the partners. Dede’s closing recommendation in our conversation is to look for the expert to solve potential conflicts between channel sales and direct sales into your organization. Click here for a full list of previous episodes.